After nearly of a year of unofficial pronouncements of the country’s recession (see, for example, NPR: Official Or Not, Consumers Sense A Recession), media outlets across the country, earlier this month, announced that the recession is now official (see, for example, NPR: Recession Is Official). So what’s the difference between an official and an unofficial recession? Unofficially, a recession could be classified as any “period of general economic decline.” Officially, a recession is a decline in “GDP for six months (two consecutive quarters) or longer.” (see recession definition at BusinessDictionary.com). 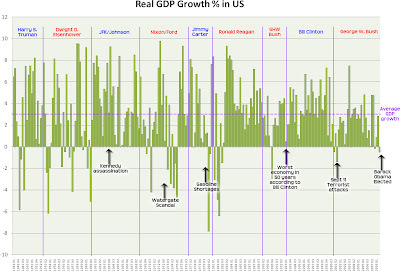 Average quarterly GDP growth, over the past 60 years, has been right at 3%. The economic data does seems somewhat cyclical, with recessions hitting every 8 to 12 years.